This archive holds all posts form August 2006. I’ve been following the discussion about astroturfing initiated by Paull Young. The first participants rushed in to condemn astroturfing. Who wouldn’t? Well, a lot of people, it seemed. And why were people holding back from such an important discussion? Much of the early discussion focused on examples of outrageously bad behaviour. Of course, it’s easy to condemn clear cut, extreme cases. But what the average practitioner encounters on a daily basis is much less clear cut. For serious practitioners that I talked to, the real issue is a working definition of behaviour that we can agree defines the line between acceptable and unacceptable behaviour. I raised this question in a comment on Canuckflack. (Unfortunately, I can’t link back to the post, which wasn’t ported to Colin’s new site when he switched to WordPress in August.) The response to my comment was positive and thoughtful. Paull Young picked up the question in a post and added a related heading on the New PR Wiki Astroturf page. And then Steve Field nudged the issue forward. I will not fabricate a public concern by paying or coercing individuals to falsely act as concerned citizens. I will only seek to help give voice to those who already hold an existing concern and/or provide education to stakeholders that might be affected by a particular issue. When supporting grassroots efforts, I will ensure that I am transparent in all my actions and clearly and publicly state what actions I am taking and which organization or client I represent. I will never knowingly distort or falsify information to help my client/interest achieve a strategic/emotional advantage in a public debate. I will encourage all grassroots supporters to be open and honest in all of their communications, just as I will be open and honest in mine. Well said Kami. I can live by that. Public relations practitioners in Toronto and Ottawa have a new monthly forum to discuss social media from a PR perspective. The Ottawa meetup is called Third Monday. The Toronto group is called Third Tuesday. And, you guessed it, they’ll generally be held on Mondays or Tuesdays. A great group of bloggers and social media enthusiasts have come together to get these meetups going. Joining me in organizing the groups are David Jones, Terry Fallis, Ed Lee and Chris Clarke in Toronto and Colin McKay, Brendan Hodgson and Ian Ketcheson in Ottawa. We believe that public relations practitioners have a unique perspective on social media. We look at social media as an extension of the conversations we have always had with journalists and stakeholders to now include a much larger group of citizen journalists and interested people whose online conversations lead to the formation of communities of interest. Others groups have different starting points and different perspectives on social media. Advertisers, for example, start from the perspective of disaggregating mass media and the need to find new advertising vehicles and strategies that will replace failing mass media campaigns. Because we have this unique perspective, public relations folks have different conversations than do those people who are grounded in other disciplines. First Monday and First Tuesday will provide us with the opportunity to talk about social media framed as a public relations challenge. We will be able to focus on its potential for and impact on our profession. How we can extend our capablities by embracing social media. How we can enhance our careers. How we can better serve our clients. And how we can then take our best thoughts forward into the broader discussion with others. Ensuring that public relations is well represented. Ensuring that public relations is in a leadership position in exploring and applying social media. We have a great first speaker to launch our meetups. Shel Israel, co-author of Naked Conversations, will kick off the gatherings with back to back sessions on September 25 in Ottawa and September 26 in Toronto. I can’t think of a better way to kick off the discussion than with a man who hails from PR and who wrote THE book on blogging. So, if you are a public relations practitioner who wants to meet other PR folks to talk about practical applications of social media, join the conversation. Sign up for Third Monday (Ottawa) or Third Tuesday (Toronto). And, for those who’ve spotted a similarity to the SF Bay Area Third Thursday group organized by Mike Manuel, Jeremy Pepper, Giovanni Rodriguez, and Phil Gomes, you’re right. In looking for a model, we thought that Third Thursday was exactly what we wanted to replicate in Canada. Mike gave us the go ahead to borrow from the Third Thursday and that’s what we’ve done. Thank you Mike! Terry Fallis substitutes for Neville Hobson as guest host with Shel Holtz in today’s episode of the For Immediate Release Podcast. Terry usually can be heard as the co-host with David Jones of Inside Pr and he is the Fallis in Thornley Fallis. Well done Terry. You made all your colleagues at TF proud. On top of that, it was great to hear a Canadian accent on FIR. Pro PR goes Web 2.0! I’m Web 2.0! and you can be too. Just go to this site. Thanks to Steve Rubel for pointing this out. I’m a “word” guy. And my photography skills are limited to point and click. That’s never really been a problem so long as my photography was limited to pictures of the family and pets. But as I try to make ProPR visually appealing, I find myself taking photos of people both at events and in interviews. The results often are not flattering to my subjects. So I was happy to see some practical tips at Digital Camera U to make my subjects more photogenic. These tips don’t involve playing with F stops and shutter speeds (what are these?) Instead, they focus on making the subject feel comfortable and appear natural in front of the lense through body posture, expression and dress. Even a technically challenged person like me can master these. Thanks to Mike Yamamoto at Besoterica Blog for pointing to this site. A hat tip to the Florida Public Relations Association for the very successful live blogging around the recent FPRA annual conference. To my mind, FPRA blog established a new standard that other PR organizations should study and emulate at their next meetings. What did FPRA do right? First, they publicized it in advance of the start of the conference through established blogs. I spotted lead up posts by Josh Hallett at hyku and Erin Caldwell at the Forward Blog. By having established bloggers post about the conference blog in advance of the conference, their established communities of readers were able to subscribe to the conference blog in time to catch all of the action. Second, the bloggers actually blogged frequently. In my experience, this has been the most frequent failure of other organizations that established conference blogs that remained virtually empty (and unvisited?) throughout the conference. FPRA’s conference bloggers – Josh Hallett, Chris Gent, Jennifer Wakefield and Bob O’Malley – posted more than 70 times leading up to and during the conference. More than enough to attract attention. Third, the quality of the posts was high – a good mix of informative longer posts with quick hits. This sustained attention. Fourth, the posts prompted a real discussion. Some posts had as many as 14 comments – which is a lot compared to other PR conference blogs I’ve visited. Finally, they used multimedia to give visitors that “being there” feeling. A nod to Josh Hallett for introducing hallway interview MP3s to his posts in addition to Flickr photos. A nice touch. The complete conference postings can be viewed under the Annual Conference category on the FPRA blog. Congratulations to the FPRA, especially their hardworking bloggers, Josh, Chris, Jennifer and Bob! Sean Moffitt has posted a list of his twenty favourite Word of Mouth blogs. And he’s looking for more. If you are a Canadian who writes a blog that deals with “word of mouth, buzz, brand experience, social media, viral or related subjects” let Sean know by leaving a comment on his post. In the wake of David Sifry’s latest State of the Blogosphere post, a number of thoughtful commentators are challenging Sifry’s estimate of 50 million blogs. A principal line of argument revolves around whether the Technorati numbers create a distorted, inflated picture by including inactive blogs. 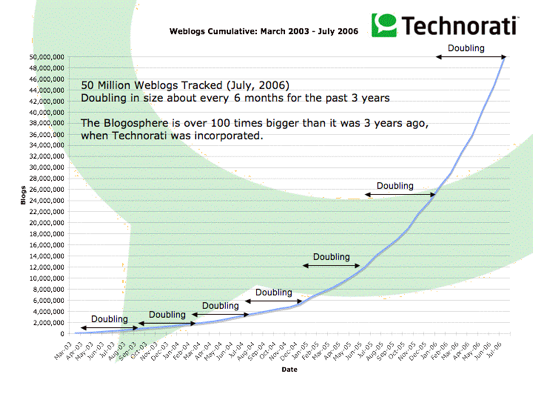 Some argue that the actual size of the active blogosphere is much smaller, perhaps closer to 1.6 million blogs. It is important to gain a better understanding of the actual participation in the blogosphere by developing a more sophisticated, refined data on the distribution and actual behaviour of bloggers. Having said that, some of the discussion reminds me of the debate that political pollsters often engage in. They focus on differences in the results between their competing polls and argue at length about whose methodology is superior. On the other hand, political pros – the people who actually use the polls – assume from the start that methodology will vary between pollsters and that these different methodologies will yield different results at any given time. What they focus on is the trends over time between polls with known and consistent methodology. This analysis enables them to understand what is really going on and to look for the drivers of behaviour, not simply the manifestation of that behaviour. When I look at David Sifry’s (or anybody’s) stats, I look for consistency of methodology and trends over time. The ongoing addition of new bloggers. The accelaration of the discussion through both new posts and comments. And the understanding that many bloggers post rarely or abandon their blogs altogether. That’s the real value for me. So, I hope the conversation continues. I will be an active follower of it (and occasional participant.) But let’s remember, there is real value in following Sifry’s results over time, regardless of whether we agree with the details of the snapshot at any particular time. 50 million blogs and doubling in size every six months. David Sifry has updated his State of the Blogosphere profile using current data from Technorati.